Anyone interested in purchasing a desktop 3D printer might be interested in a new project that has launched over on the Kickstarter crowd funding website this week for the Kudo3D Titan 1 SLA 3D printer. 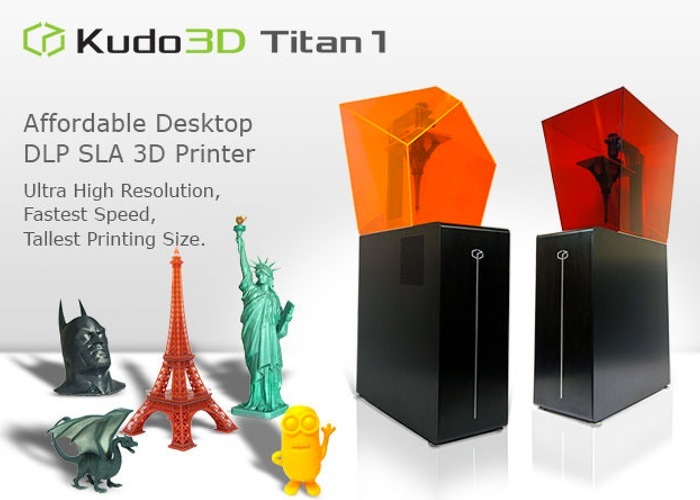 As well as being designed to provide a small form factor desktop 3D printer the Kudo3D Titan 1 also boasts up to 2.7 inches per hour print time and is capable of printing 9.5 inch tall 3D printer models with a minimum 37 micron resolution. The creators of the Kudo3D Titan 1 SLA 3D printer say that compared with Stereolithography (SLA) competitors, Titan 1 is at least twice as fast and has the largest printing size and is now available to purchase for $1,899. The Titan 1 desktop 3D printer project is currently over on the Kickstarter crowd funding website looking to raise enough pledges to make the jump from concept to production. So if you think Titan 1 is something you could benefit from, visit the Kickstarter website now to make a pledge and help Titan 1 desktop 3D printer become a reality.